Denny Jump (Bellevue, WA, United States) on 20 July 2011 in Landscape & Rural. 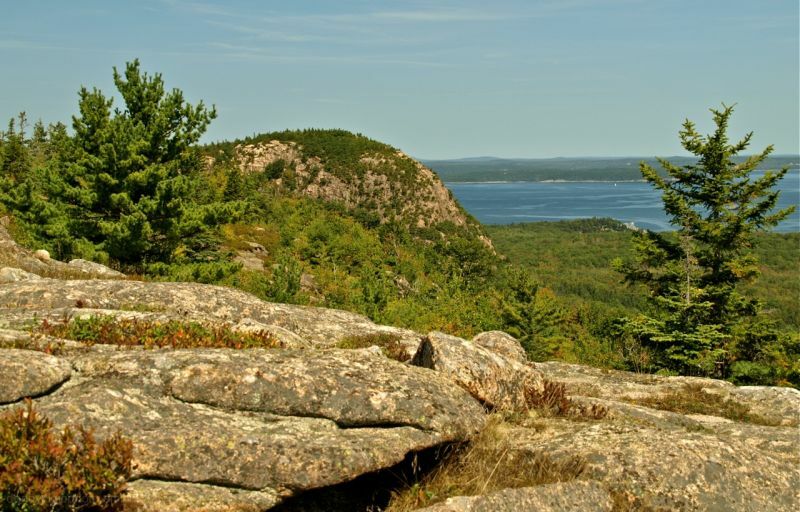 This is a view from atop Gorham Mountain in Acadia National Park which is located in the State of Maine. The views and features throughout this park are spectacular. @Richard: Hi Richard - Thanks very much. These images today and the next few days (tomorrows post may be a complete;y different subject, if I have time to work on it)were captured in September of 2009 when Barbara and I visited...I was hoping for an early autumn scene but the weather had been warm and nothing was turning yet...but the "upside" was that the weather was dry and spectacular so we had a great time anyway ;-) Thanks very much! What a beautiful landscape!. It seems a quiet, peaceful place. I love this photo. @Meritxell: Hi Meritxell - Thank you very much for your kind comment! I just loved your Jazz Fest images of Dee Dee and Lee Ritenour..fabulous! This is a park on my bucket list. I love all of the granite on the coast. Guess where I am right now-in the Portland, Maine International Jetport. I got to spend the night here because of flight delays and missed connections. I just spent a week on an island off of Bremen, Maine for a teacher workshop at an Audubon Camp. That is why I am so far behind on comments and replies. @Julie Brown: Good Heavens...well I hope you get back to nice and cool Indiana today becasue the New England States (and PA, NJ, NY etc, are bracing for a monster heat wave...already 90 here this morning in Western NJ at my work..Hang in there, Julie! I feel alive just viewing this photo ~ GORGEOUS!!! @Scene by Sharon Photography: Hi Sharon - thank you so much...great job on your sports images of late!! Great landscape, Denny. Love the large rock slabs in the foreground - balances beautifully the view to the blue horizon. Looks to be a lovely coastline and national park. @Stephen: Hi Stephen - Thank you so much...I was instantly drawn to the rocks on the coast there! Thanks very much! 93 degrees on the coast of Maine yesterday! Well I made it to DC, but the flight is delayed over two hours and counting. Who knows when I will get home? It is just as hot in Indiana. @Julie Brown: Hi Julie - Hang in there! Thanks very much! Looks like home to me. Beauty shot Denny. @Williams: I am sure that it does...and it is beautiful, Paul! I would certainly like toget up your way and soon! Esopecially if Michelle Bachmann gets elected!!! A fantastic landscape, and a pleasure to look at in the four walls of my office on my lunch break. Really wish I was out there now! @Ainsley: Hi Ainsley. Thank you very much for your kind comment. I am glad that this helps with your day. I, too am walled in during the days! I love your images....looked through them earlier this morning. They are great! That's a beauty of a landscape, Denny! I just love those huge rocks in the foreground - excellent shot! @Jason Politte: Thanks Jason - We were there 2 years ago in nid-September. Unfortunately, the weather had not changed yet. We really enjoyed it though. I also love those rocks! Beautiful scenery, lovely pines...what a great view you have! Have a nice day. I's still frightened about sighting bigfoot after yesterdays great shot. Lordy, lordy !! What a beautiful view and photo. a view i love so well! this is definitely one of my favorite spots on the east coast - the whole park, i mean! thanks for taking me there again, denny! @franz: Let's meet up there next time you come to the states! Thanks Franz!! A lovely shot, Denny. This is another place I would like to see. Awesome view Denny and I hope it's cooler higher up in Maine! This wide expanse is beautiful. I had a trip to Maine once in my life, coming from Germany, and I never forgot it. I just love that jagged rocky beautiful shoreline. I can't wait to see more from your trip! Wow, look at all that lichen on those rocks!